Curious about the upcoming Cadillac Production coming to the Bowling Green plant? Here are some answers for you . . .
Q: How is the Cadillac coming? A: Preparations for the Cadillac are moving along very well. Engineering is working on assembling the cars in the earliest pre-production builds. This allows them to problem solve issues that arise during the build. At the plant, they have just hired the first seven employees who will help with these pre-builds as well. Q: What options will the Roadster have? A: The Roadster will have very few options. However, night vision, adaptive cruise, backup assist, etc., will be standard on the car. Q: Is the Cadillac shorter than the Corvette? A: Yes, the frame is shorter by four inches or so. Q: Where is the Cadillac going to be built? A: There will be changes made to the Bowling Green plant in the upcoming year. The supermarket and tire install equipment will be moving out of the plant in order to make room for the general assembly area for the Cadillac. Q: Will there be two shifts for paint? A: Yes, there will be two shifts for the paint shop, as the Cadillac requires two carriers to paint one car. The Cadillac panels will be painted horizontally to ensure top quality. A C5 Thanks to Jane Bowlin, editor of the Vette Gazette, for sharing this Cadillac information with the C5 Registry. Mid America Designs needs to borrow a Z06 for a photo shoot for an upcoming cover and inside apparel shots for their catalog. Yellow or red is preferable but not mandatory. No one will drive your car, the owner can be present the entire time, if so desired. The location is in the Boca Raton―Ft. Lauderdale area on Dec. 20. It will be an all day and evening event. If you are interested, please call Cheryl Habing at 217-540-4252 by Dec. 14. Members: Breaking news!! The "RP" has announced that a tie has occurred between 2000 Millennium Yellow Coupes with Torch Red interior and 2000 Millennium Yellow Convertibles with Torch Red interior. This HOT story breaking from Bowling Green, KY, continues to break along party lines! FIFTEEN Millennium Yellow Coupes with Torch Red interior have been produced, twelve of them being 6-speeds and three automatics. On the other side, FIFTEEN Millennium Yellow Convertibles with Torch Red interior have been produced, seven of them 6-speeds and eight automatics. The totals are THIRTY coupes and convertibles with nineteen 6-speeds and eleven automatics. These figures have been checked and double-checked BUT….. Those in charge are calling for a manual recount of the vote! We would like to announce a process change to the Millennium Yellow and Magnetic Red constraints on the Chevrolet Corvette. These colors are currently allocated on a national basis. This means that dealers with Corvette allocation for a given target production week can view the total national target quantity and placements. If a dealer who has been allocated the constraint decides to configure a model with a different color, that constraint goes back into the national "pool" and is available to any other dealer in the nation. Beginning on October 27, 2000, we will now allocate these two colors on a dealer (BAC) level. If a dealership has been allocated the constraint, that dealer will see the target quantity of "1" (or whatever quantity they were allocated) in the constraints screen. Unlike the national level constraint process, no other dealership has access to this constraint, it is specific to the dealer. If a dealer is allocated a Magnetic Red or Millennium Yellow constraint unit and chooses not to use it, the constraint will be reallocated the following week. This enhancement will eliminate the need for dealers to continually check for color constraint availability on the chance that another dealership has given theirs up. It should also eliminate the need for a dealership to participate in the Friday "rush" to secure a color constraint on Corvette. This process will begin with the October 27, 2000, order generation on the Corvette Z06 model. It will then be rolled out to the Coupe/Convertible allocation group starting with the November 10, 2000 order generation. This change applies only to the Magnetic Red and Millennium Yellow constraints on the Coupe/Convertible model, and the Millennium Yellow constraint on the Corvette Z06. Members this is an UPDATED partial list of parts numbers we have researched for the 2001 Z06 and misc. part numbers for the 2001 C5. This is for our members only – please do not pass this information to non-members. We will continue to research and post additional part numbers in the future. We began this project because members wanted to update their C5s with Z06 components. REAR SHIELDS (back of Gas Tanks) effective with start of production on the 2000 model year. RIGHT SIDE GM # 10410937 TEMP # (new # DUE TO Z06 MODIFICATION) RIGHT SIDE WILL BE GM # 10306421. RT side GM # 10444693 must be painted to match. LF side GM # 10444692 must be painted to match. The Front Brake Pads were a special pad provided by GM Performance Parts (GM Part Number # 12480154) which lists for $135.00. Corporate Member Dealer # VC001, Bruce Glueck Chevrolet, has agreed to sell these Performance Pads to C5 Registry members for $113.40 plus shipping to you. Please contact Parts Manager Ken Bassett at 1-904-792-1111. GM Performance Parts has also come out with Front Performance Rotors (Part Numbers left rotor GM # 12480155 and right rotor GM # 12480156). These C5 Performance Rotors have a different metallurgy than stock C5 rotors. They are a thicker design - less prone to warping, checking or cracking. These rotors and brake pads allow the driver to handle the demands (especially heat) of racing better than stock parts. DVT "Road Test" Under a Roof.. The Dynamic Vehicle Test, or roll test, is not only one of our tourists’ favorite stops, it’s also (and most importantly) a major test of our end of the line product quality. Does Corvette accelerate, stop on a dime, and have lights that work? The DVT measures it all and much much more. Ron Branch, a utility auditor and DVT coordinator for the past eight years, said DVT measures 98% of the components in the car. That includes mechanical items like the brakes, transmission and rear axle. It also measures electrical functions like power seats; light switches and even the memory of the keyfob. DVT stays busy throughout the day since 100% of C5 production makes a run through on of the two booths located just past the alignment pit. The driver revs the engine up to a speed of 75 miles per hour for a period of 45 seconds. The car sits on rollers that spin the tires around. While DVT, a computer outside the car is connected to the vehicle’s ADL. Following about three and one-half minutes in the booth, the car either passes or fails. By far, most of the vehicles breeze right through this part of our inspection process. Since every Corvette must pass this test before leaving the plant, any cars that fail go next to repair. Following the appropriate repairs, they must again go through DVT. When they get a thumbs up at DVT, all vehicles head for water test. At between 96.5% and 97%, Branch said Corvette’s first time pass rate is very good. A rate of 96% means that out of 131 vehicles, only five or six failed the test. If a car fails, the problem is not only fixed; the source of the problem is found and corrected. "If there’s a problem, the operators are very receptive to making changes," Branch pointed out. He looks into every single item found on DVT and checks on the source of the problem. Several operations on the assembly line – especially jobs where wiring is connected – are critical to the DVT pass rate. These operations are identified with a pink sheet. A 35-year veteran, Branch said he especially likes working on DVT and with the people. "It gives me a chance to learn about Corvette and the business. I learn something new every day." He transferred here in 1981 from St. Louis where he worked for a year on the Corvette line. Among his closest co-workers are DVT drivers Don Million, Larry King, Nellie Smith and Berdine Miller. When any of them gets a 100% pass rate for the day, congratulations are in order. "We all get excited when that happens," Branch said. He also helps educate other employees at meetings where he shares DVT information with them. A BIG C5 Thank You, to Jane Bowlin, Editor of the VETTE Gazette for informing the Registry of this latest factory procedure. If you are a member coming to the Las Vegas Show and want to attend SEMA, which starts on Tuesday, October 31st and runs through Friday, November 3rd, you must be registered. Please email Dan Adovasio at c5dan@c5registry.com directly or call the C5 Registry Office at 321-452-2743 and leave a message. Dan will then email you the appropriate information for registration. The price is $40 per person payable directly to SEMA. Space is limited so contact Dan as soon as possible. Email registration closes October 15th., 2000. As fortune would have it, one of our members came upon a rare sighting on a transport outside of Bowling Green. As all of our members know, Nassau Blue (RPO 23U) was discontinued late in the 2000 model year. Low and behold, an error at the plant has occurred! Wil Cooksey, Plant Manager, has anybody told you, that Some How, Some Way, Some Fluke…. Has occurred, and a 2001 Nassau Blue Convertible was produced in late August. According to eyewitness accounts, it is an automatic, with a white top, black interior, loaded with a 1SC Option Package. Our eagle –eyed member observed some additional options which included high polished wheels, CD changer, and (after climbing under the rear), confirmed a Z51 handling package. This 2001 one of a kind fluke’s VIN (ends in) 15102652. Talk about instant COLLECTABLE!!! Mr. Cooksey, where was quality control when this one went out the door??!! MAKING THE BEST EVEN BETTER!!! J.D. Power Survey confirms (what Registry Members already know) that the 2000 C5 was the best vehicle produced by GM during the last model year. The gauntlet for the 2001 has been thrown down. Mark McGehan, Quality Manager says "we are going to make the best vehicle in GM even better…. we are going to close in on the items that we know were a concern on the 2000 model year". What tops the list you ask? Wind noise and paint blemishes. We have learned that the plant is ready to combat these quality items by starting a drive audit including water test, squeak and rattle and a dynamic check. To protect the C5s spectacular paint job the plant will begin to apply (during the week of August 7th) a paint protection (said to be heated strips of laminate that will be applied to the horizontal surfaces, like the hood, roof, hatch and decklid) before transit. This is a very unique system in that after the strips are first applied, the Corvette travels through a very low bake oven. Once the C5 has had a successful "in transit" to its dealership the strips can be easily removed. SPECIAL UPDATE TO JULY 12, 2000 HOT NEWS! The model change over from 2000 to 2001 at the Bowling Green Assembly Plant was rather unique; it was a "rolling model change". That means as each area of the plant builds out, the new 2001 model will be right behind the old 2000 one. !! As you know the last 2000 Corvette came off the line on Monday, June 26th, as did a number of 2001 Corvettes did that same day. The first 25 units were part of Chevrolet’s captured fleet which is used to identify early quality and customer concerns. Many of these were driven by Chevrolet and Corvette Executives on their two week vacation shut down – July 1st through July 16th. Anyone who attended the Black Hills Classic Event got a chance to see one of those Corvettes. Executive Russ Craighead brought a Black Z06 (appropriate color for the event) to the Classic and spent a weekend driving it around the Black Hills! Everyone enjoyed checking out the Z06 and we appreciate Russ’ willingness to let everyone take a peek! If you want a great run with your Corvette, I would make the Black Hills Classic a "must attend" for your 2001 schedule! The Z06 you took delivery of is not equipped the same as the Z06 the press took on their press tour and tested. The press Z06’s had an inexpensive performance upgrade that is a must for all Z06 owners. Members the Z06 that the press and I tested at the Mid-Ohio Race Track had special brake pads provided by GM Performance Parts. It seems that the performance brake pads really added to the stopping power for the Z06 brakes…but, they squeak. GM made a decision to avoid needless warranty complaints (squealing) by putting on a different pad and will list these performance brake pads in their upcoming GM Performance Catalog. Those of you that race know that high performance brake pads squeal. We are presently trying to locate the part number for you and will provide you with the information as soon as we receive it. It has come to the attention of the C5 Registry that if the 2001 C5 Coupe, Convertibles and Z06 are not properly broke-in you may experience a whining rear end noise. While at the Bloomington Gold Show we were able to visit with several engineers from GM Power Train. The consensus is that C5s that are driven "somewhat hard" out of the box are experiencing a whining rear end sound. GETRAG the manufacturer of the rear axle assembly has notified the factory that this noise is being caused by improper break-in, the gears not being allowed time enough to mate through various heat and cooling cycles. They are requesting that a normal driving cycle of up to 350 miles be acquired before you begin to "ENJOY" your C5 to it’s fullest potential. This 350 mile break in period for the rear end assembly will ensure a PROPER mating of the rear end gears and eliminate any "unwanted play" in the GETRAG gear set. Be advised that this not a new for 2001 concern – this has been true since 1997, but with the upcoming arrival of the Z06 this type of break in may be more important than ever! Dan Says – regarding his Z06 (due in August) he has advised his dealer NOT TO ALLOW a "test drive" by anybody (technician, lot porter, or owner) before he arrives to supervise the dealer prep. After learning the above – he wants to have full control of the break-in. The plant’s first model year of the new century comes to an end today when the final 2000 Corvette rolls off line. Just moments after saying farewell to the last 2000, employees will usher in the first of the 2001 model year. The first area of the plant set for build out was the Paint Department followed closely by uniframe. On Thursday, June 22, employees in the Uniframe put together the last of the 2000s and changed over to the 2001 frame. Since this is a rolling model change, as each area of the plant builds out, the new model will be right behind the old one. Plant planning coordinator Tom Lohmann said the last 2000 Corvette is currently scheduled off the final line today. A number of 2001 Corvettes are also expected to come off line. The plant will only have four additional days of 2001 build before going down for the two week July shutdown period. More than two dozen of the early 2001 model will see action over the downtime. The first 25 units will become part of Chevrolet’s "capture fleet." Lohmann explained that these cars will be assigned to staff and engineers from both here and Michigan who will drive them extensively starting with the downtime. "We use the captured fleet to help us identify early quality and potential customer concerns," he said. "Each of the drivers will constantly evaluate the cars and complete detailed quality evaluation forms. The information from those forms will be collected after the downtime so that we can address any issues as soon as possible." Once testing of the captured fleet Corvettes is complete, the units will eventually be refurbished and become salable vehicles. A BIG C5 Registry thanks to Jane Bowlin and the Vette Gazette, the Bowling Green Plant’s weekly newsletter, for sharing this exciting news! There hasn't been a lot of news lately we could post in the members only section. There is a lot of news, but most of it is concerning the 2001 Corvette and the hot new Z06! We are under an embargo and can't post this until July 1, 2000. The other news it more of a public nature, and we want to keep this section special for our members so, finally, here is some news!! First on the NET!! - Final Production Numbers by RPO Code for the 2000 Model year! Access is only available to C5 Registry Members. Vehicle Description: Passenger vehicles. The lap belt webbing can twist allowing the webbing to become jammed in the retractor. When the belt webbing becomes jammed in the retractor, the belt may be unusable. 1-800-222-1020. Also contact the National Highway Traffic Safety Administration's Auto Safety Hotline at 1-888-DASH-2-DOT (1-888-327-4236). As you may already have noticed, initial order generation of the newly enhanced 2001 Corvette Hardtop took place on May 8, 2000. these orders were distributed to only the top 195 Corvette dealerships in the country. There will be no PROSPEC information on this model until the early July timeframe. Please be aware, however, that there is only one PEG available for this model and only a few freeflow options. If you are one of the top 195 dealers that received a Corvette Hardtop, you will need to make any desired changes to the vehicle in the Vehicle Order Management System. VOMS has all of the necessary information you will need to place these initial orders. You can change the order by highlighting it in VOMS, then clicking the change button. The next Corvette Hardtop order generation will be in July, after the ordering information has been fully released and updated in PROSPEC. If you should need any clarification this issue, please contact your Area Sales Manager or Market Area Manager. ZO6 Allocation available TODAY! Phones have been ringing off the hook today at the C5 Registry office as the Corporate Member Dealers call in with the Z06 allocations they received today. Allocations range from 18 to 3 pre selected units. Some of the dealers reporting in are: Les Stanford , Steve Moore, Kerbeck, Bud's Chevrolet, and Bruce Glueck. The dealers tell us the target production start date is June 5th with target production of 403 units. The dealers also tell us each dealer is being shipped a pre-selected configuration. Keep checking for Updates! Pro Spec information regarding the 2001 C5 that was sent to Corvette Dealers during April, has been modified. Dealers will receive UPDATED ordering information before the May 9th order Acceptance date. Dealers will be informed that (before the May 9 ordering date) the initial packaging of 2001 C5 options HAS BEEN MODIFIED. We believe that some additional stand alone options have now been added to the 1SB or 1SC packages and possibly those packages themselves have been modified. Many members have asked, since the base seats (AR9) are only in the 1SA package, will you be able to still order the (AG2) power passenger seat? Over 2500 AR9 seats were ordered with AG2 power seat last year. We agree that deletion of this option may be an error. We have asked the question and will inform you as soon as we know. As many Registry Members already know, Corvette has gone to packaging for the 2001 model year. ‘01’s availability will be two basic packages above the already standard 1SA package. The 1SB option package which is the standard equipment package and adds to it, the memory system (power seats, sports bucket seats, dual zone air), fog lamps and the rear luggage shade. The 1SC package includes all the above plus electrochromic mirrors (new for 01), HUD, twilight sentinel and power telescoping steering column. The Convertible packaging is slightly different in that the 1SB package includes the electrochromic mirrors. Members call your dealer now!!!! Dealers can only order Coupes or Convertibles at this time for submission in the first round of ordering, which begins on Tuesday, May 9th.As of this date there is no information on ordering Fixed Roof Coupes (Hardtops) in the dealers computer system. Which leads us to believe the Hardtop (RUMORED ONE) will be something VERY SPECIAL in 2001. On Friday, April 14th, Gary Cowger, Vice President of General Motors in charge of Labor Relations, visited the Bowling Green Corvette factory. His scheduled permitted a tour of the NCM during our C5 Birthday Bash Event. To our surprise he stopped by the C5 Registry table to thank Dan Adovasio and ALL the C5 Registry Members for the "THANK YOU PARTY" we threw for the plant employees during our 2nd Annual Birthday Bash in April 1999. His comments were very gracious towards us as he went on to say "your thank you of plant employees was unprecedented throughout General Motors". We told him it was just an expression of our admiration for those employees who build the "BEST VETTE YET"!! "CORVETTE CONVERTIBLE NAMED "BEST ENGINEERED"
Readers of the Society of Automotive Engineers' (SAE International) Automotive Engineering International Magazine voted the 1999 Chevrolet Corvette Convertible as the "Best Engineered Car of the 1990's and Best Engineered Car of the 20th Century". Winners were chosen for each decade with the exception of the "1990's" and the "Century" overall, in which the 1999 Chevrolet Corvette shared the award with the 1999 Mercedes-Benz S500. Winners were announced in Detroit at the SAE 2000 World Congress. It's always exciting when our favorite Corvette C5 wins ANOTHER award. Looks like the SAE has just confirmed what every C5 Registry Member already knows!! As stated in the 2001 GM Product Preview Fleet and Commercial Vehicle Guide (HOT NEWS February 28, 2000) there will be a 5 HP gain for the LS1 base C5 Corvette engine for 2001. Further review of the LS6 GM Power Train press release indicates that one of the increases in HP will come by the elimination of an external EGR Valve. It is our belief that this improvement will also be made on the 2001 LS1. Technicians have stated to me that a possible way to eliminate the use of the EGR Valve (to meet strict emissions law) might be to "do it internally" by an overlap on the cam. Based on the emails we have received, we believe a CLARIFICATION is in order. For model year 2001 there will be a new WHITE color. This new WHITE (name will be released at the Birthday Bash) is NOT a TINT COAT color. The current tint coat production line does not have the capability of increased production of any additional colors at this time. Millennium Yellow and Magnetic Red II have taken up all the current capacity, and will continue this trend in 2001. The "RUMORS" across the Internet speculating on a PEARL WHITE (Diamond White – Cadillac Color) will NOT be made available on the 2001 C5 Corvette. (As a HINT to the new WHITE (RPO 40U) color name you would have to figure out another name for RACETRACK.) Let the guessing begin…..
What does Net and Gross Field Supply mean? (that means they more C5s on trucks than at all their dealers) The net field supply reflects the number of days (at the current selling rate) it would take to sell all of the vehicles on dealer lots. 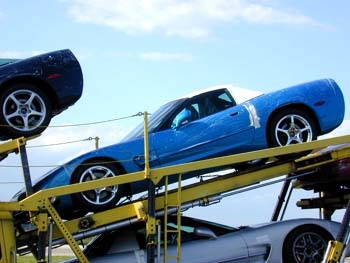 Gross field supply means all unsold vehicles that have been shipped from the plant and are either at the carriers, in transit, or at the dealers.